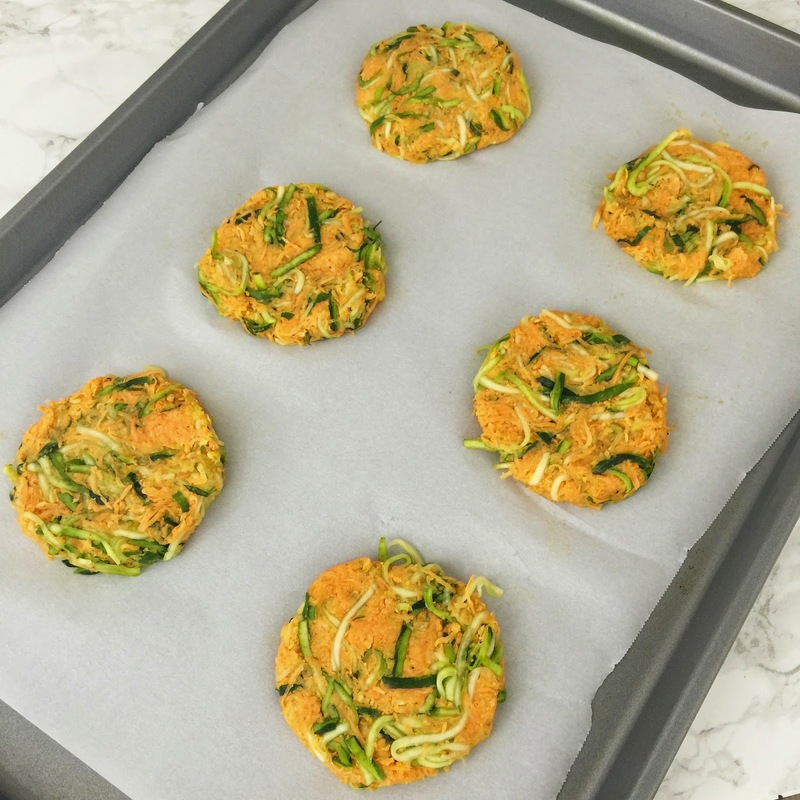 I have been working on expanding my healthy recipe repertoire, and as soon as my friend Jennifer told me about these sweet potato and zucchini patties, I knew they would be a win. And let me tell you, they were - these will certainly be on repeat in our house! 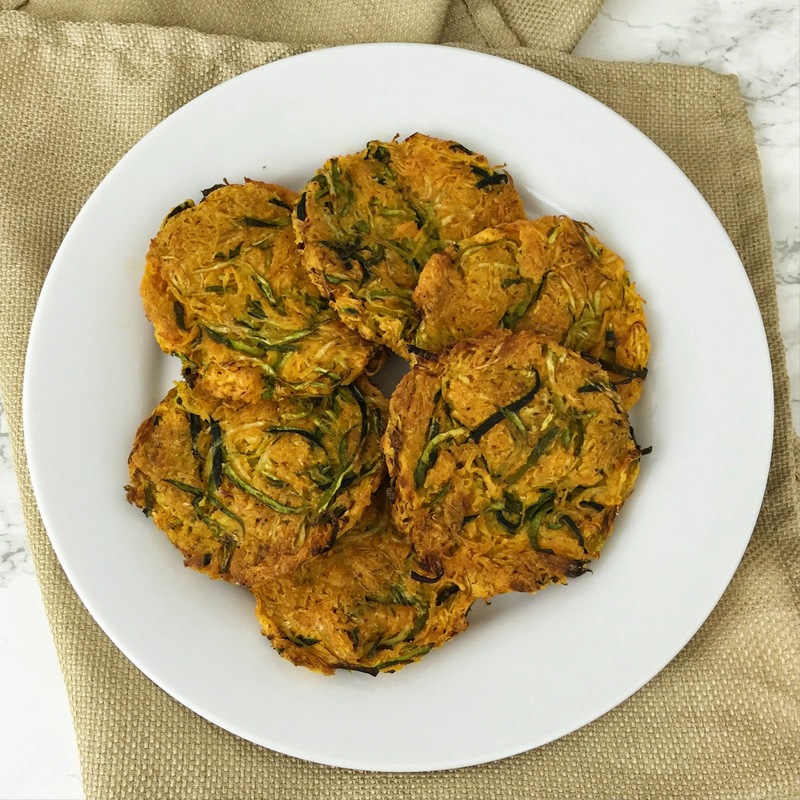 I'm not joking when I say that these patties would be great for breakfast (as a hash brown substitute), as a grab-and-go snack, or as a side for a lunch or dinner! I don't have a food processor, so the preparation was a bit labor intensive, but it was most certainly worth it. 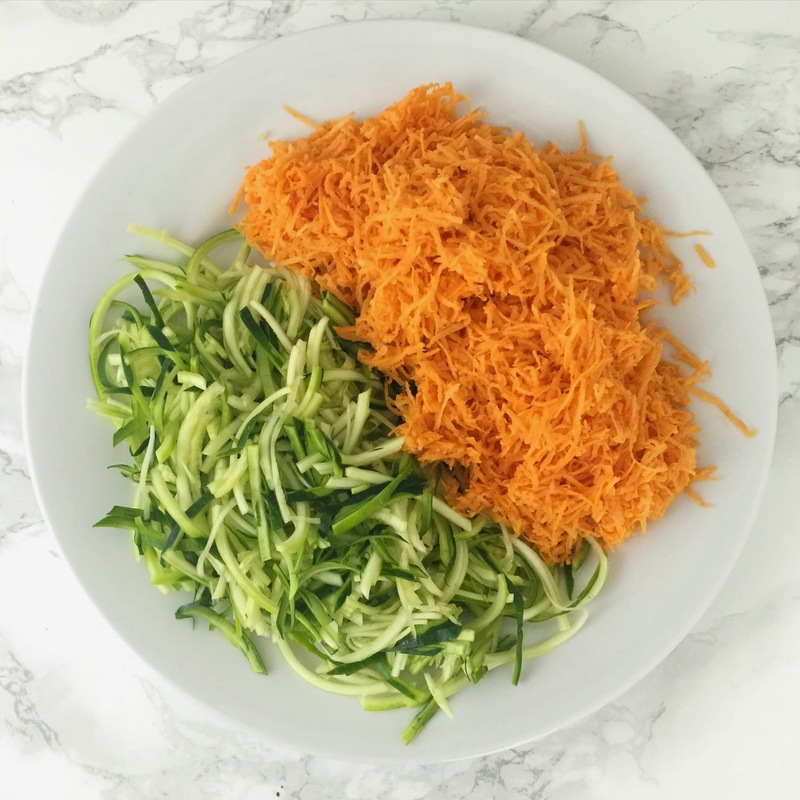 Begin by spiralizing 2 cups of zucchini and grating 2 cups of sweet potatoes. Squeeze out as much moisture as possible from the veggies (...I went through quite a few paper towels!). Next, mix together 1 egg, 1/4 cup of coconut oil, 2 tsp of flour, 2 tsp of sriracha (or more, if you're like me! ), 1/4 tsp of salt, and 1/2 tsp of pepper. Mix together the veggies and sauce and form the veggie patties. After I formed my patties, I squeezed out any additional water that I didn't originally get out. Bake the patties for 10 minutes at 350 degrees, and then flip the patties over and bake for an additional 15 minutes. This recipe made 6 patties, and I will most certainly be doubling my batch for next time. John and I ate these in about 15 minutes flat, and didn't even get a chance for left overs (fingers crossed for next time, but with John as my husband, my chances aren't good...)! Wow these would definitely be a hit with my husband. Will be trying ASAP! These look delicious!! I need to try these soon! 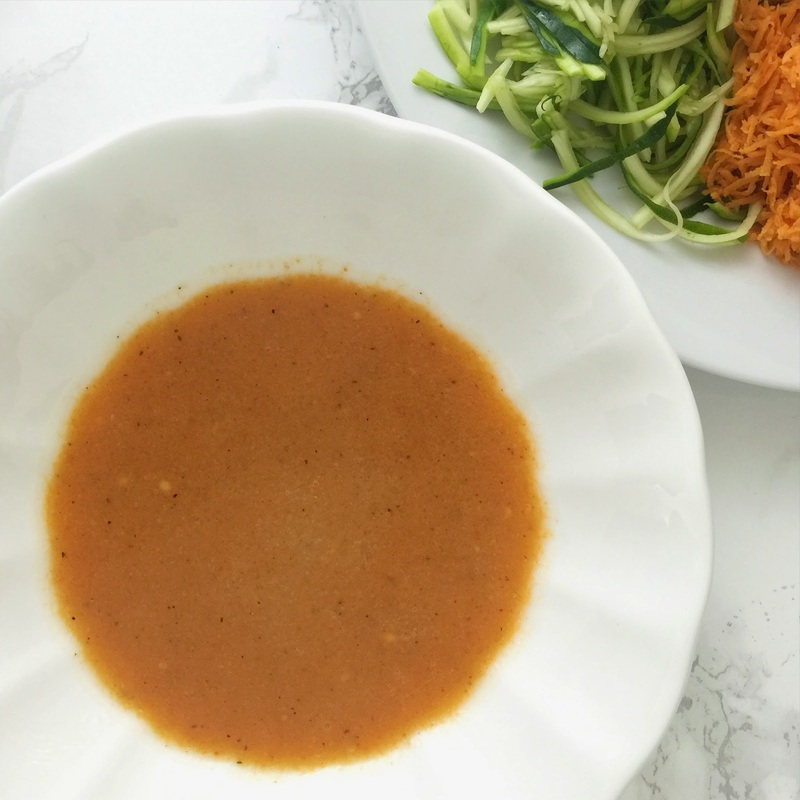 Spiralizer to the rescue! :) These look delish!!! 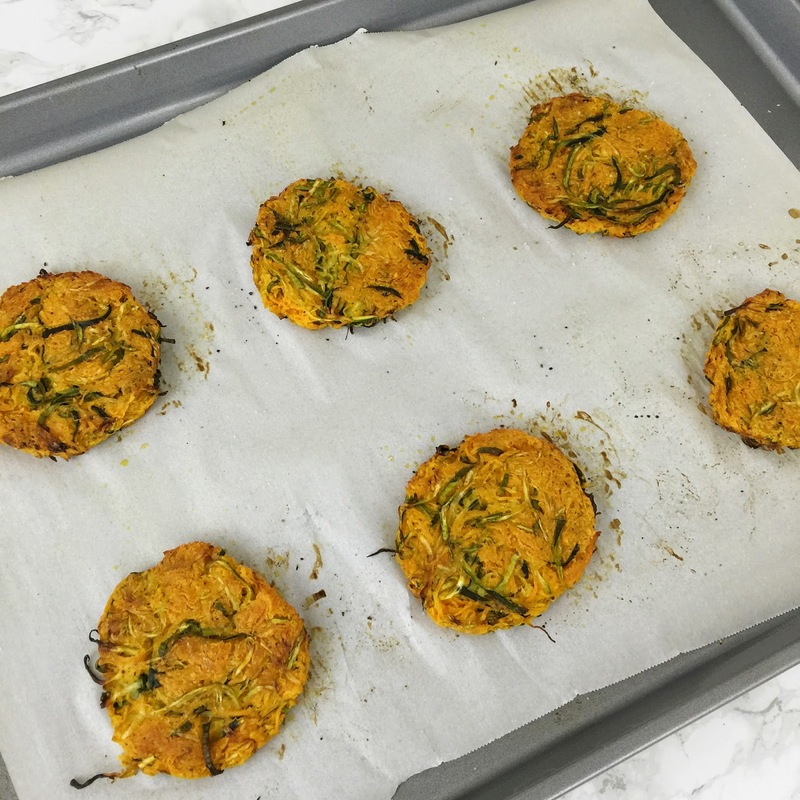 Ooo this look good, and a good way to get a good dose of vegetables, I will have to give them a try, thanks for sharing! OH MY GOSH!! I GOTTA MAKE THESE! & YES, I'm SCREAMING ABOUT THIS!!!!! These look delicious! Any suggestions what to serve with them for dinner? Mmmm I love sweet potatoes. These look great! Yum!! Looks sooo good. 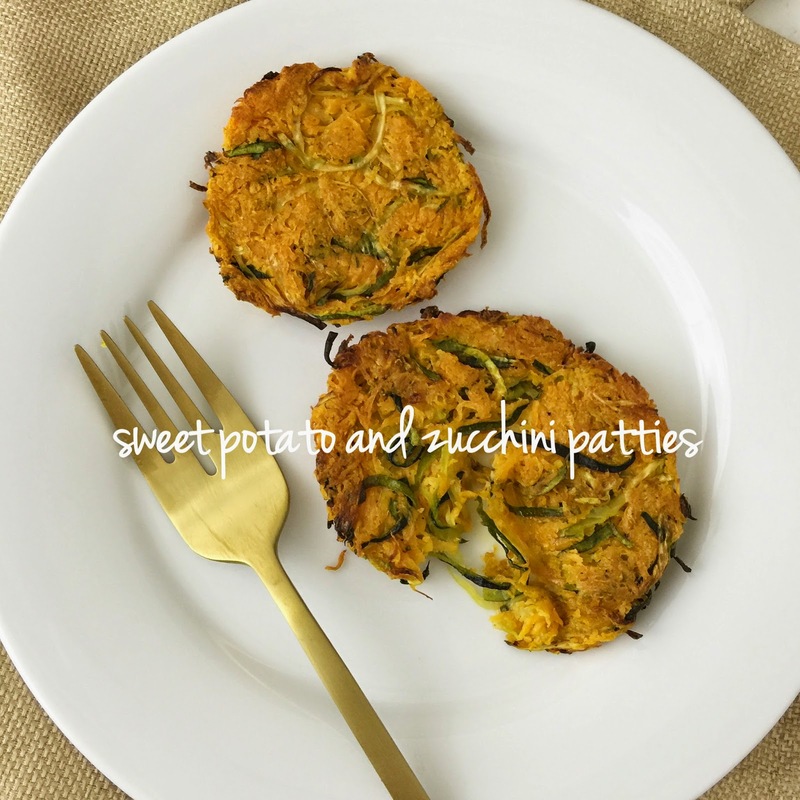 I have a similar version that I make but it doesn't have sweet potato! Yum! If only the hubby liked sweet potatoes. I might just have to make them for me! These sound like they would be so good! I like sweet potatoes when they're mixed in things-- or basically not just a baked potato, haha and I love anything with zucchini! I got a new spiralizer cook book and love the idea of using sweet potatoes but haven't done it yet. Do these get crispy in the oven (please say yes so I'm not tempted to bust out the frying pan haha). Just pinned this so I can make ASAP!! These look delicious!! These looks awesome...can't wait to make them!